Read more about the new state and national society logos in the Members section. 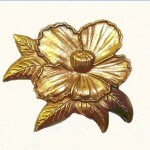 The official pin of the Georgia Society is the flower of the Franklinia alatamaha tree. For more information or to download an order form, see the "Forms" section.